After a three year hiatus from having been involved in the world of sports card collecting, I have found myself returning to the hobby in 2015. Consequently, I have decided to resurrect this website & blog. Since I last posted, I have managed to get married and move from London to Amman in Jordan. Whilst this lifestyle change has left more time in my life for hobbies, it has also meant leaving the vast majority of my card collection in storage back in the United Kingdom. So, whilst I have not bought or sold and cards in the last few years, my collection is being missed! The mechanics of living in Jordan are also going to determine how I interact with the hobby and build on my existing collection. First, there is no way to purchase cards within the country, so everything needs to be imported. Second, there is no door-to-door postal system here. It is possible for residents to to open and hold a mailbox at a local post office, but my residency is unlikely to be available for a couple of months. Even then, I am currently not that confident in the quality of the postal infrastructure shipping anything of value. Consequently, the only way I currently have of getting cards delivered is via couriers such as FedEX and DHL, which is not cost effective for single cards in individual envelopes. In order to mitigate these shipping cost, I am using an international shipping and package forwarding company in the USA. Essentially, this means I can arrange for cards to be shipped by sellers to a mailbox in Florida and then have them all consolidated and sent to me every couple of weeks by courier. Finally, both the costs and mechanics of clearing customs can be a challenge. All of the above means that I am likely to be concentrating on purchasing reasonbly priced singles cards. 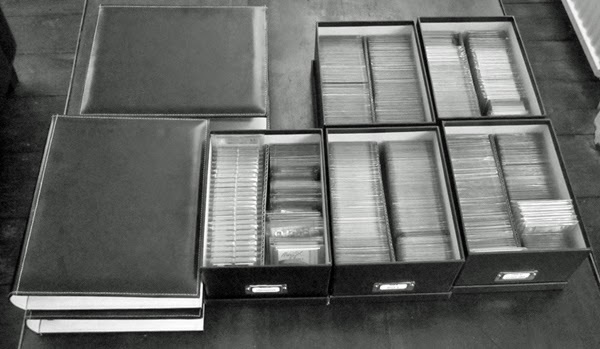 Box breaks are going to be few and far between and trading with others potentially a bit of a challenge. Over the next few posts, I'll lay out my plans in terms of what I intend to collect as opposed to how I am going to manage it!